I love writing about holidays, celebrations and live-affirming traditions from around the world. 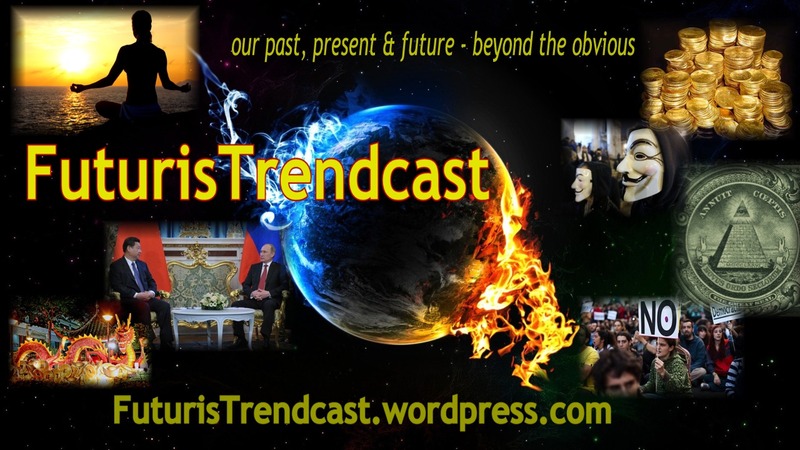 On this blog, I have written extensively about the Russian New Year celebration, March 8 – the International Women’s Day, as well as about various Chinese New Year celebrations and traditions. I have also written about the festivity that was the Sochi Olympics. Two years ago, when this blog was just starting out, my friend from India, Pranjal Borthakur, and I did a post together. That post immediately became one of the popular posts on my blog. 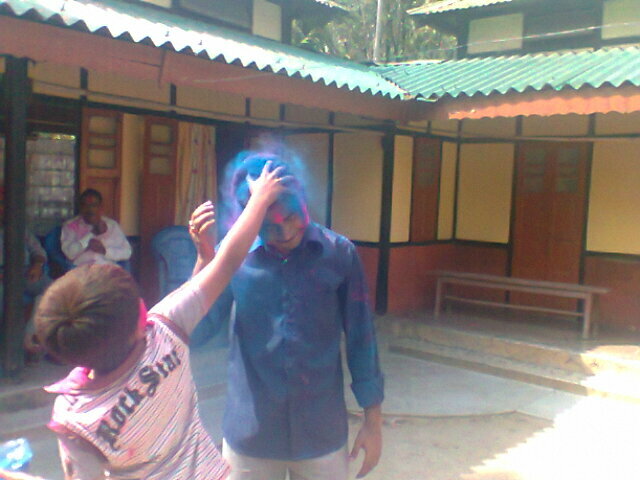 It was about Holi, the famous Hindu festival of colors, as well as about Pranjal’s school. Read the original post (with great pics + history and traditions of Holi): Holi, the Indian Festival of Colors, with Guest Pranjal Borthakur. 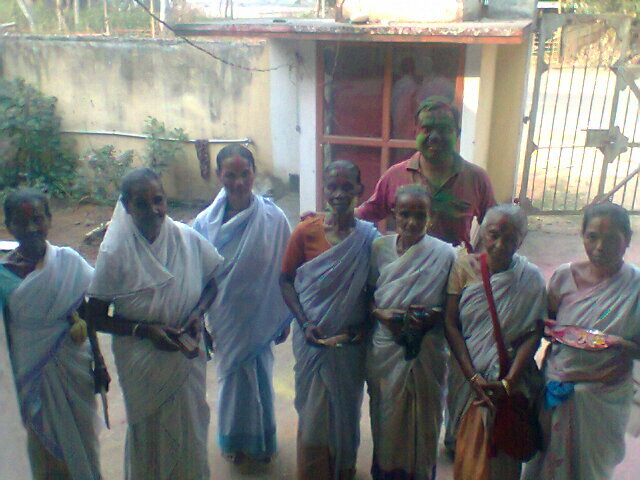 Today, my guest Pranjal again is graciously sharing some wonderful photos of his home and the beautiful celebration of Holi in the capital of the Indian province of Assam, Guwahati. 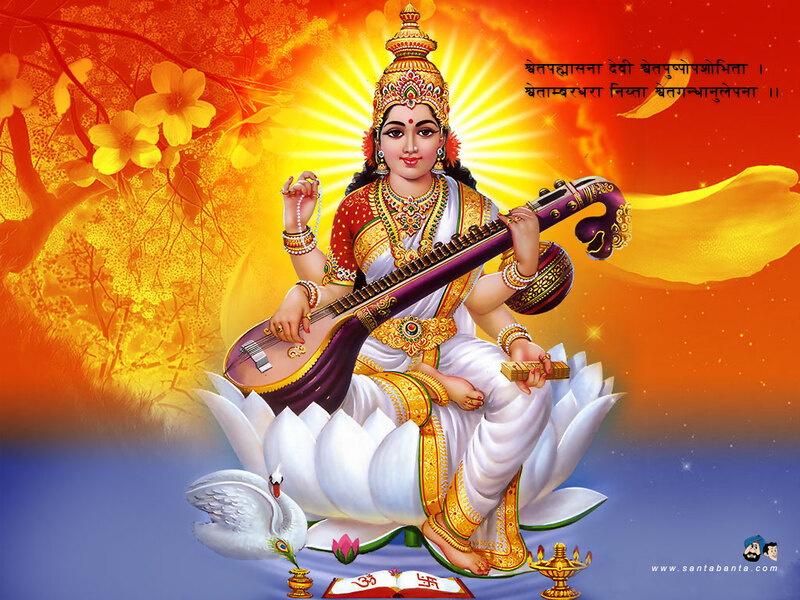 This time, in addition to Holi, Pranjal, his school and family have also been celebrating the birthday of my favorite Hindu goddess Saraswati, the patron of the arts, knowledge and wisdom. 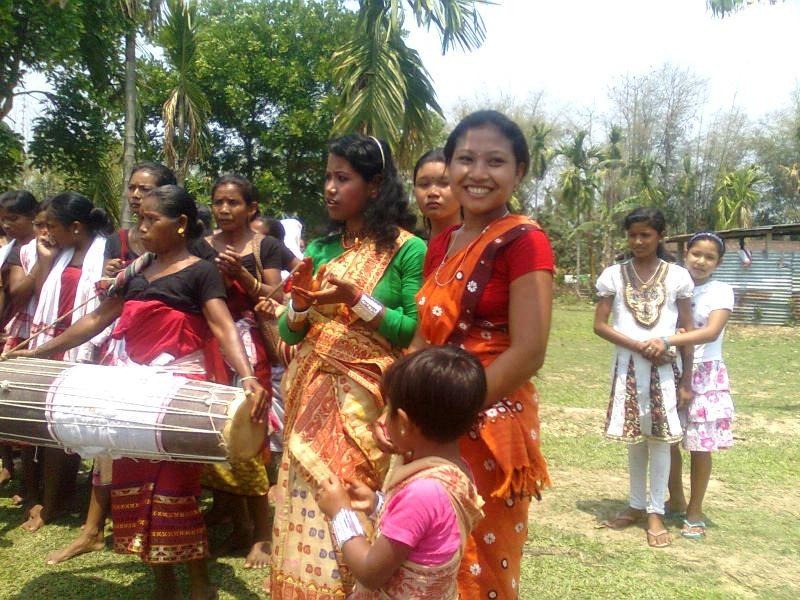 Bihu is a set of three cultural festivals celebrated in the Indian Province of Assam and other regions of the Indian subcontinent. 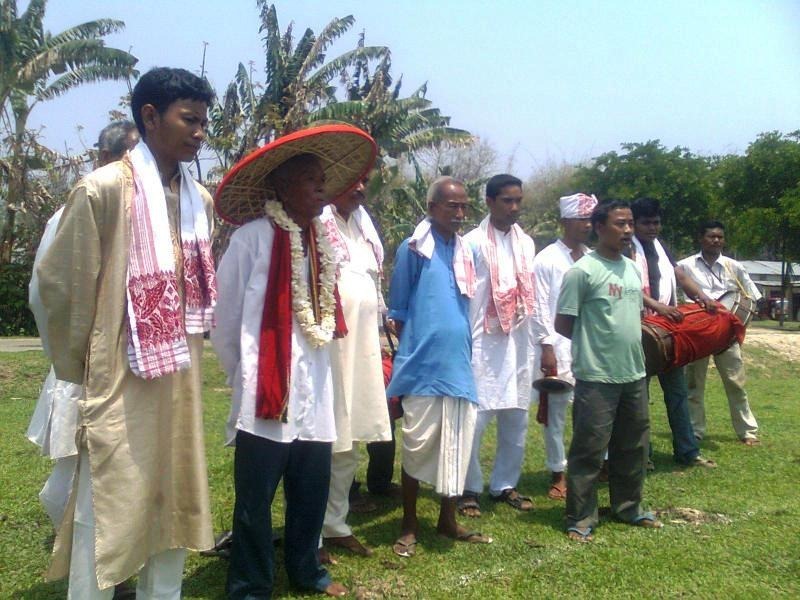 The most popular, Rongali Bihu, celebrates the onset of the Assamese New Year in mid-April (around April 15). 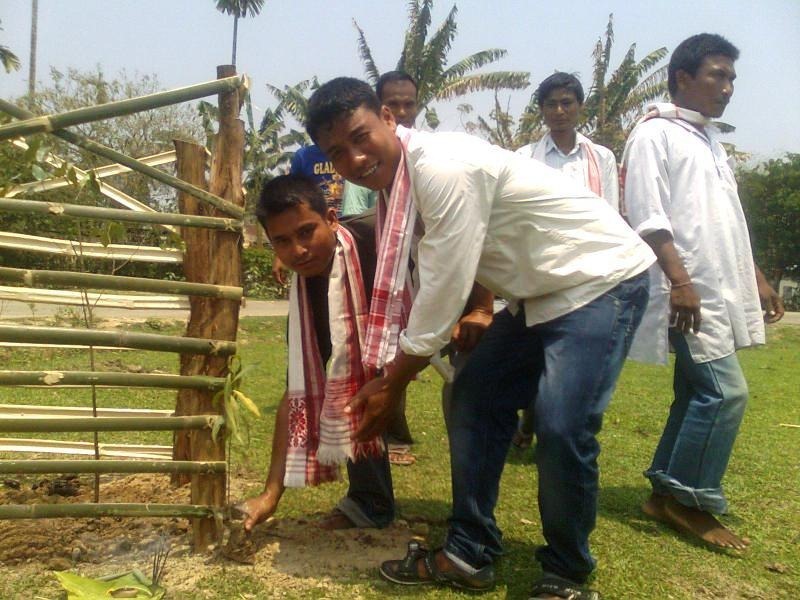 The second, Kongali Bihu, occurs in mid-October, while the third, Bhogai Bihu, happens at the end of the harvest season in January. 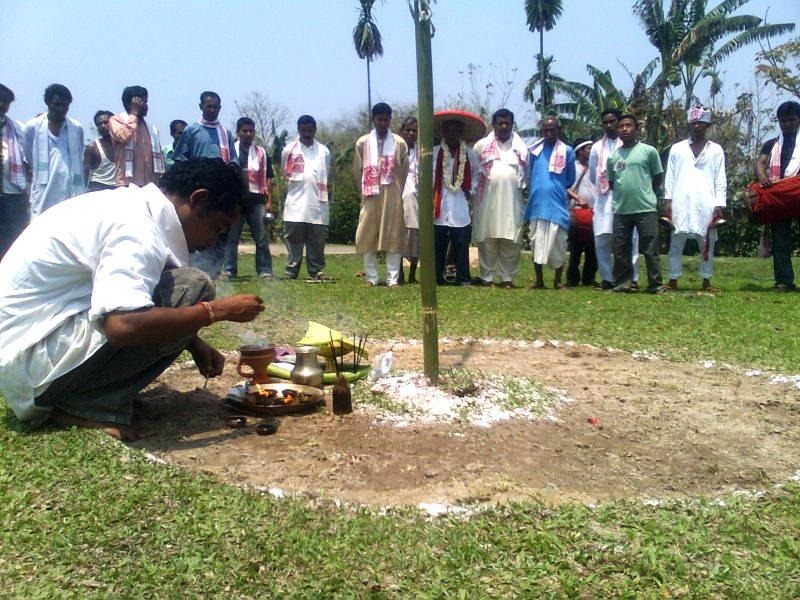 Rongali Bihu commemorates the first day of the Hindu solar calendar and the beginning of the agricultural season when farmers cultivating their fields feel a sense of joy and optimism. 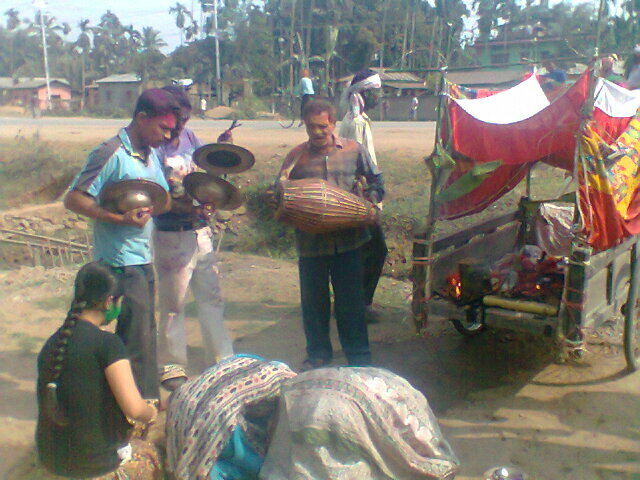 The ancient festival lasts seven days and is known for its feasts, lively performances, and merriment. 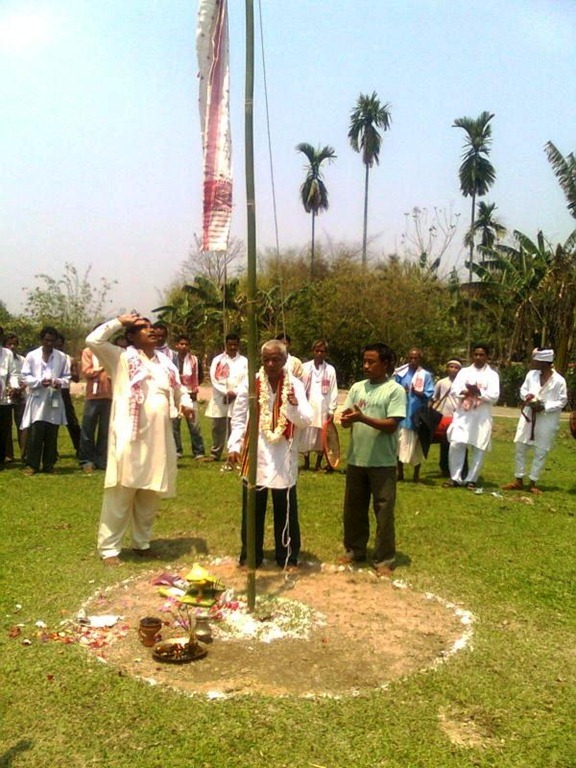 The celebration generally transcends castes and religion and has evolved into a more secular festival that promotes humanity, peace, and fraternity between the classes and faiths. 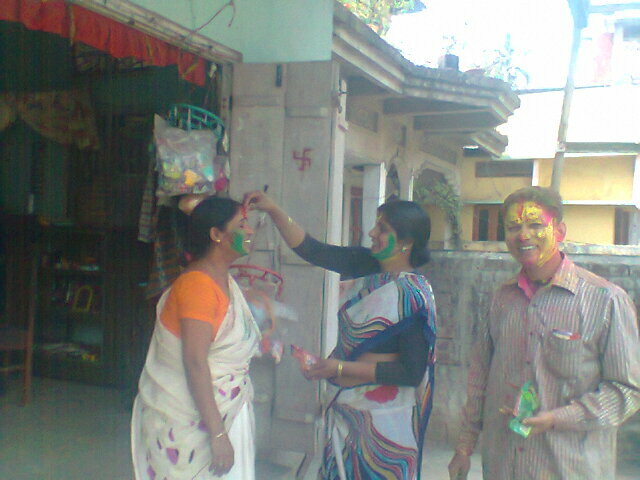 Lada says: Everywhere around the world, Hindus celebrate Holi, the Festival of Colors, a popular springtime festival observed on the last full moon of the lunar month. Participants traditionally throw bright, vibrant powders at friends and strangers alike, celebrating the arrival of Spring and allowing everyone a momentary freedom. Winter is over and spring arrives as nature awakens with its abundance of colors, joy and generosity. This is what this beautiful and flamboyant festival is all about. 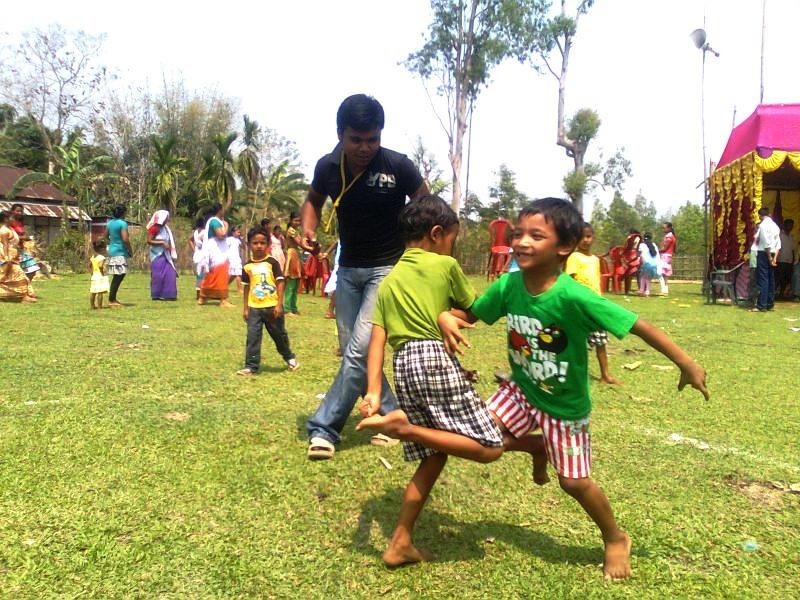 This very special post about Holi, the Indian festival of Colors, is a joint effort between two people: Lada Ray, originally from Russia and currently residing in New York, USA and Pranjal Borthakur in Assam, India; and between two very different parts of the world, far removed physically, yet interconnected. Because where friendship, culture and art are concerned, physical borders don’t matter and distances are nothing! I am sure my friend, Pranjal, will agree with me on that! 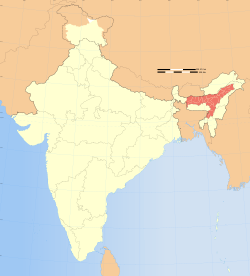 The state of Assam is located on the northeastern tip of India, just south of Tibet. It borders Bhutan and Bangladesh and is famous for its teas, as well as for Assam silk, diverse wild life and the mighty river Brahmaputra. He is a mathematician, not a writer or linguist; writing is not something he does every day. And English is NOT his first language (come think of it, neither it is mine). While delivering his post, he apologized profusely to me about his English. No need to apologize, Pranjal! Believe me, many of those who’ll read it only wish they could speak and write in your language, like you do in English! Please note, only light editing has been applied, to preserve authenticity. 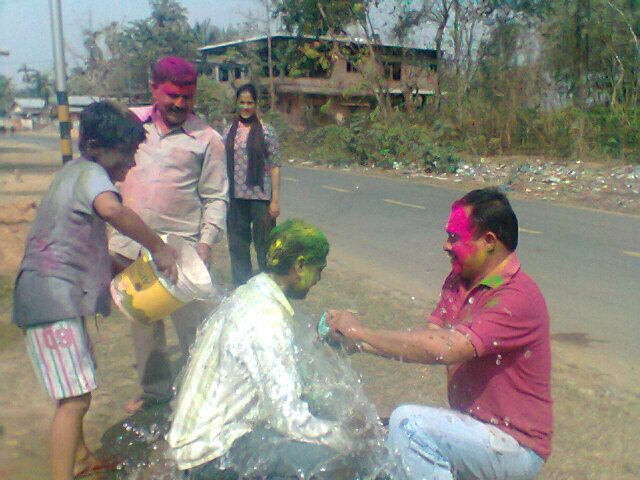 Pranjal says: Holi is a festival of colours since it has many dimensions. It symbolises Respect, Friendship and Love. 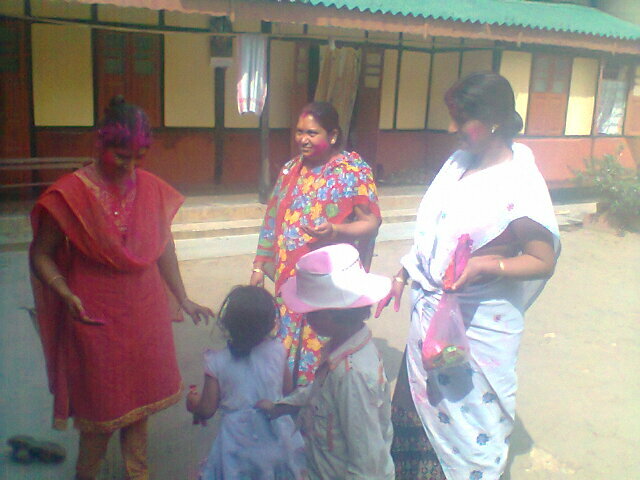 Which Lord Krishna believed..
Pictures below: Pranjal celebrates Holi with family and friends. Lada says: These vibrant colors remind me a little about the movie PLEASANTVILLE. Remember how in the first part of the movie everything is black and white. And then, when everyone in that world of regimented and obedient life awakens and comes alive, all of a sudden, the entire world turns technicolor. 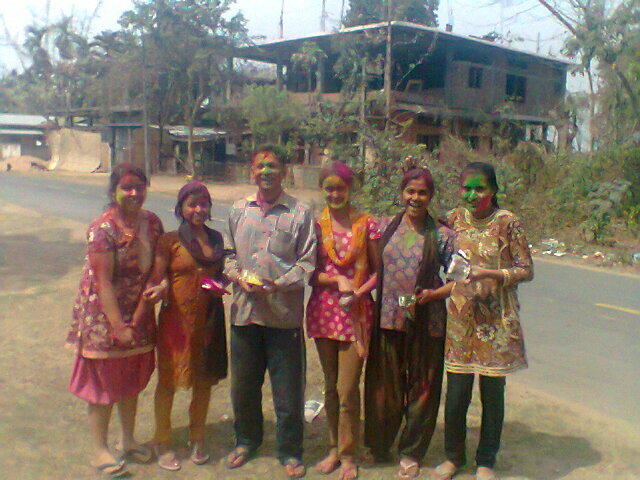 Lada says: In the old days, the colors for Holi were made out of petals of bright local flowers. The flowers were dried up and then powdered, until they turned into the very fine and colorful dust. The symbolism behind it was wonderful: when you rubbed the flower powder into your skin, you imbued yourself and your dear ones with the beneficial energy and natural essence of that flower, along with its vibrant scent, color and growth. And when you tossed the flower powder in the air or at your friends, you generously shared the abundance and prosperity the flower symbolized with the entire world. Unfortunately, the colors used today tend to be artificial, so at least some of the benefits of this beautiful ceremony are lost. 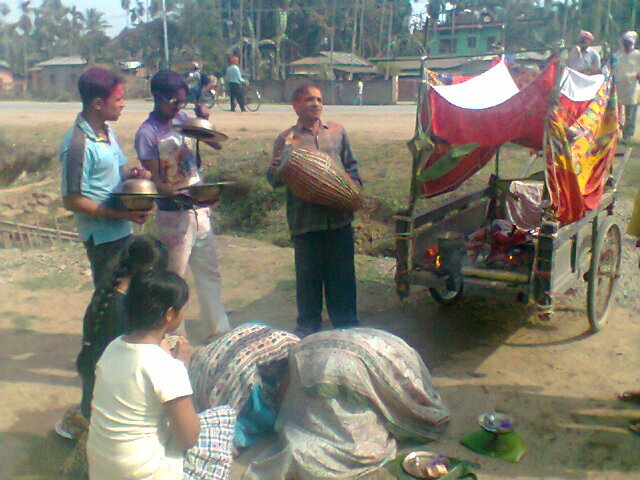 Lada says: Along with bright colors, a lot of water is used during the festival. 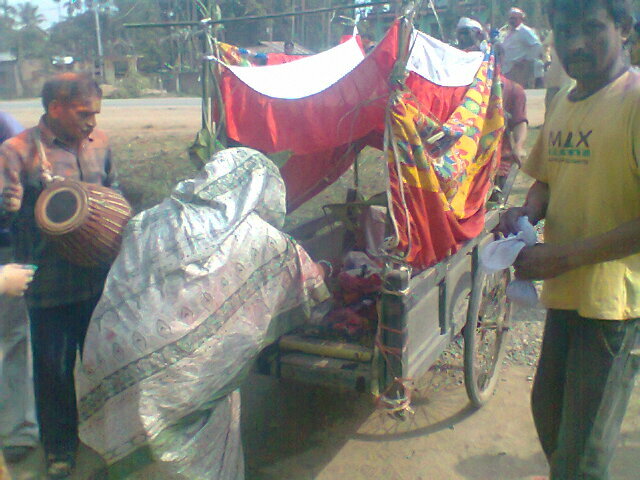 Sometimes, people are doused with whole buckets of water, as shown in the picture below. This is interesting to me. While the vibrant colors symbolize the awakening of nature and the blossoming of flowers, the symbolism of water is undoubtedly this: in the spring, you need to water plants in order for them to grow and deliver abundant crops. If you start the spring right, ushering in this new energy of growth and life, the whole year will be abundant and successful! Beautiful symbolism, if you ask me! 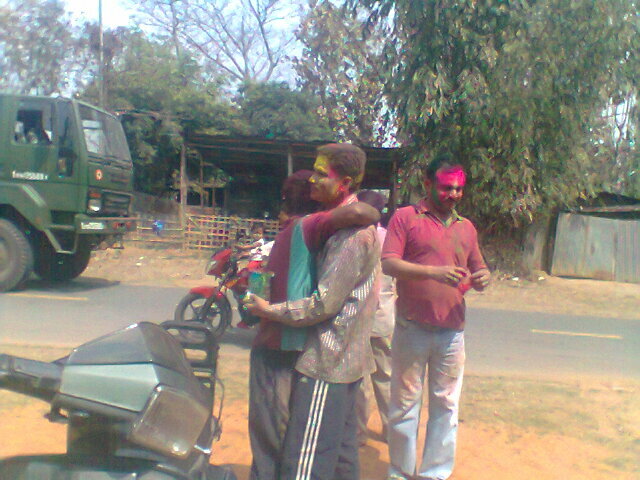 Pranjal says: Traditionally, at dawn of the 2nd day of Holi, the young must greet the Elders. They respectfully apply colours to the Elders and receive Ashirwaad (Blessings) by touching the Elders’ feet. 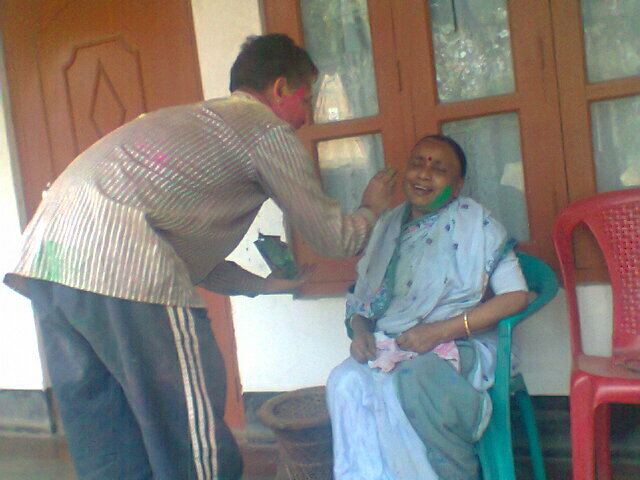 Pictures below: Son respectfully applying colors to his mother and receiving her blessing. 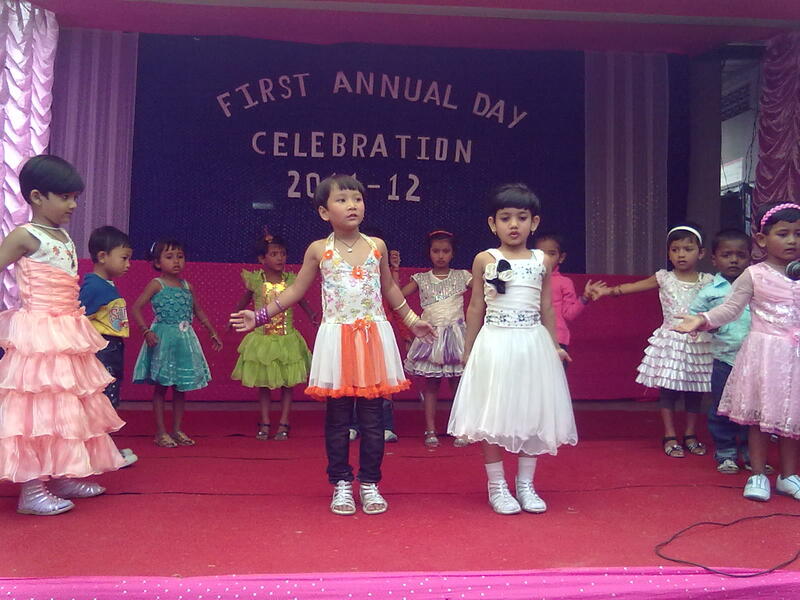 Pranjal says: The festival ends with same, with which it started: Worship of Lord Krishna’s image. 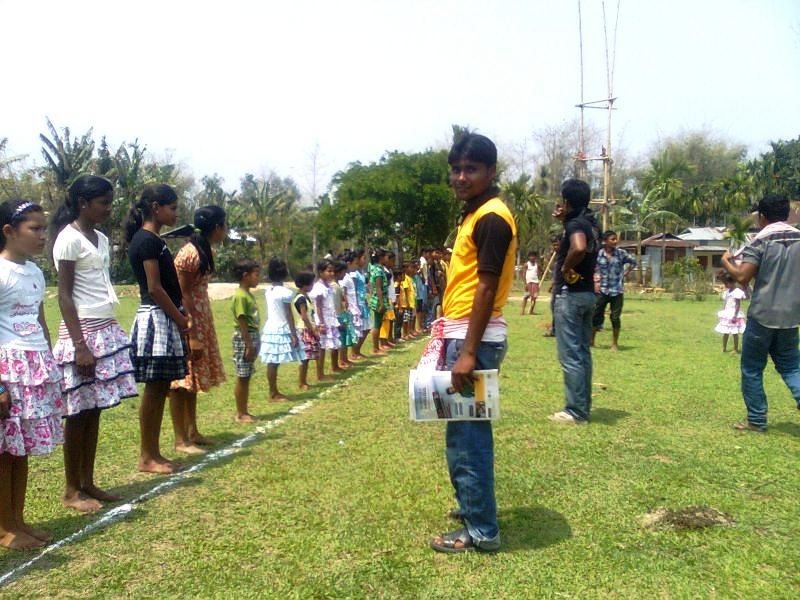 But it starts with Villagers going to NaamGhor to offer prayer. At the end of the 2nd day, the Holly Idol of Krishna goes house to house, where people welcome him with prayer and offerings. 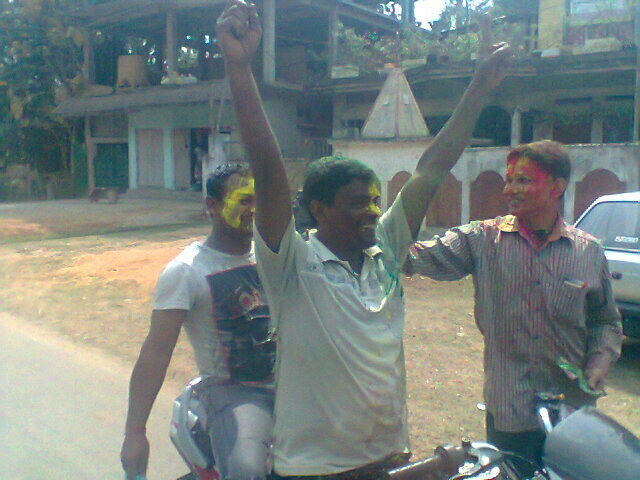 This marks the end of the Festival of Holi. 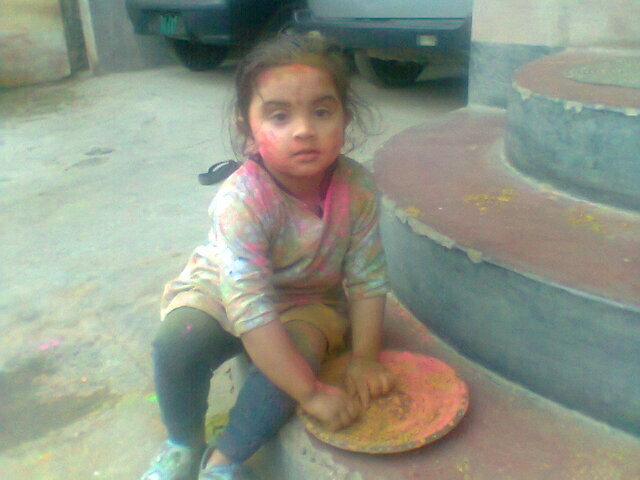 Pranjal says: But the happiest moment of the whole festivity was when my sweet niece, Mamu, didn’t want to stop playing with her colours. 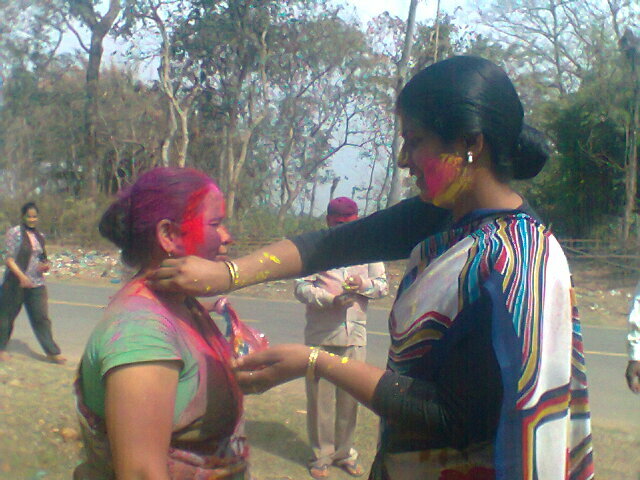 She kept saying, “Munu mur logot Holi kheliba!’ In Assamese it means, “Munu, will you play with me Holi?” Munu is the name she calls me. Isn’t Pranjal’s little niece absolutely adorable? 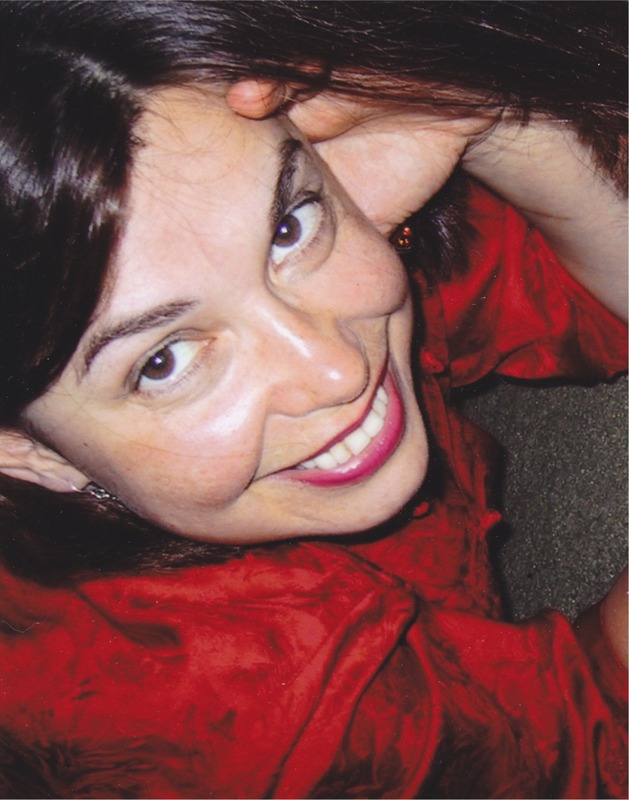 Lada says: And now, this is the linguist in me talking. Does the word “Holi” remind you of anything? It does to me – namely, English words ‘Holiday’ and ‘Holy.’ Confusing? On the contrary, enlightening: both English and Hindi belong to the same Indo-European family of languages with common root in the ancient Sanskrit. 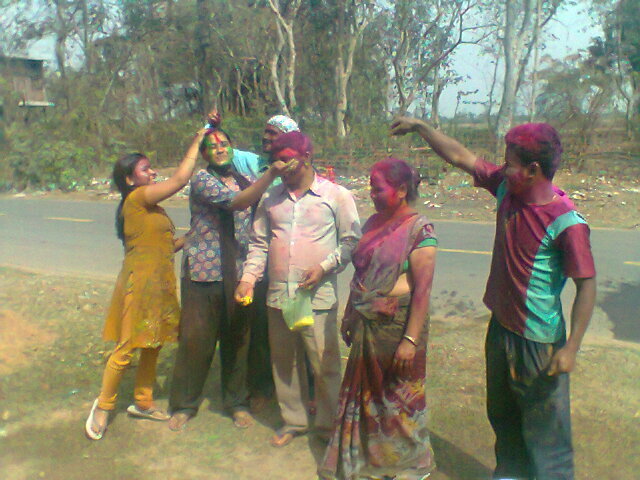 This is where the word ‘Holi’ originates from. 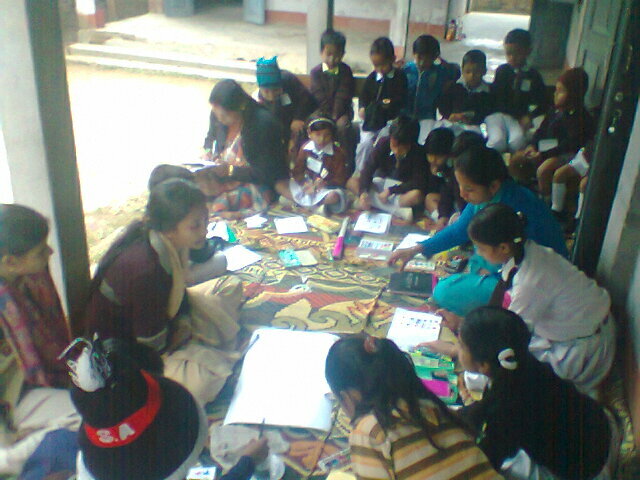 Lada says: Pranjal Borthakur is a mathematician and a poet of life. 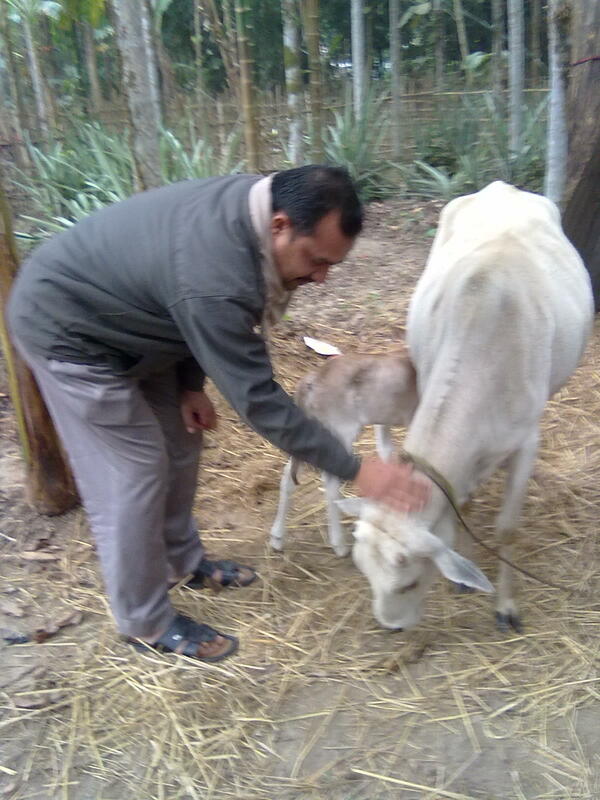 He is the owner of a small school in Guwahati, Assam, India. 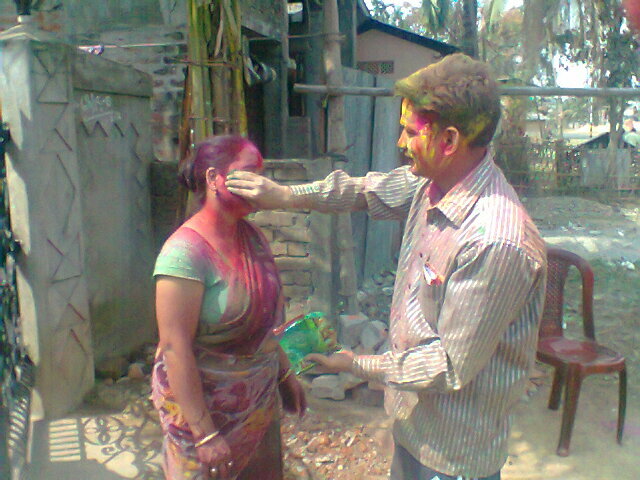 I want to thank my guest, Pranjal Borthakur, for sharing his family’s Holi Festival Celebration with my readers. 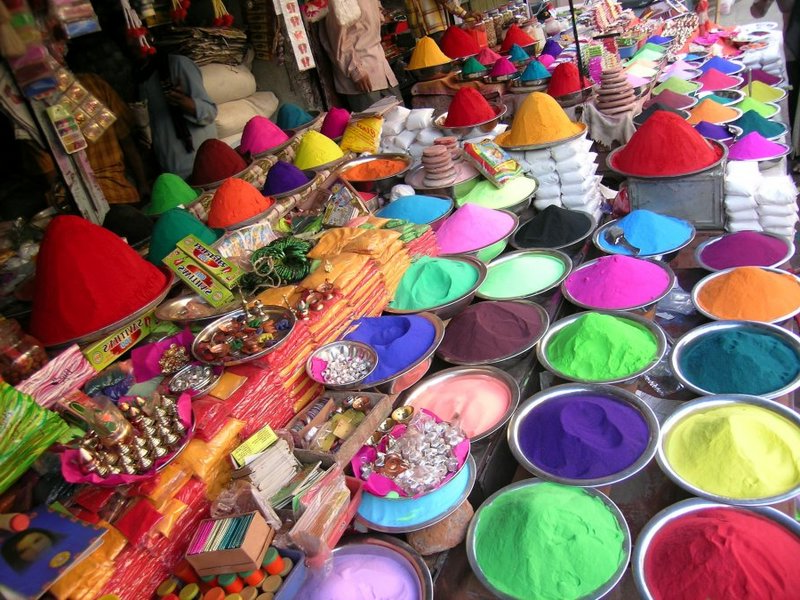 Wishing everyone a Happy Holi and a wonderful and joyful spring!